Read/WriteWeb had an interesting post a few weeks back entitled “Rethinking Crossing the Chasm.” Those of you who know me know that I’m a fairly devout practitioner of chasm-crossing ideas and that I’m a big believer that they work, particularly in markets where there is no mainstream demand, for either a specific time period or in general. I’d argue that some markets, however, are born lucky and never have a chasm-crossing phase. For example, we once hired The Chasm Group when I was at Business Objects to help us with a strategic planning session and we spent most of the time arguing with the consultant about whether the model even applied to us. My personal conclusion from the discussion was that business intelligence (BI) never had an in-the-chasm phase. Why? Perhaps my training in seismology causes me to remember the elastic rebound theory part of the book better than most, but remember that Crossing The Chasm (CTC) was primarily about disruptive infrastructure technology. The idea was that a crack in the bell curve developed because disruptive technologies were, well, disruptive. That therefore caused more normal, mainstream individuals and companies to fear adopting them until they were “safe” (i.e., generally perceived by the herd to be mainstream, safe, and reliable). That in turn drove the creation of the chasm phase — you’d already sold everyone who wanted whizzy-ness, so after what appeared to be a smooth take-off for a company, you’d find yourself flying into the chasm because all the whizzy-oriented people had already bought precisely one copy of your product and no one in the mainstream would yet dare touch it. CTC theory says the solution to this problem is total focus on a single entry point (one industry, one problem) in order to build a complete solution, attractive to mainstream buyers. In the sequel, Inside the Tornado, Moore then argued that the single entry point should be treated as the “head pin” (switching metaphors) in a bowling alley and that companies should treat further market development as an exercise in leveraging success off that head pin, by targeting and knocking down adjacent pins (i.e., markets). My theory explains BI evolution very well. The market experienced neither a stalled, chasm phase, nor a hypergrowth tornado phase. Nor did the BI market naturally coalesce around a single leader early on, instead having several strong leaders even to this day (e.g., Business Objects, Cognos). Because the technology was not disruptive there was less risk, so no chasm. Because BI technology was more tool than infrastructure, there was no market need to identify one clear leader. No one died if they picked Cognos instead of Business Objects, whereas with a real infrastructure technology, getting the wrong guess on platform (e.g., ASK’s choosing Ingres instead of Oracle) could be fatal. In ASK’s case, it cost them their birthright to transition their leadership in MRP into leadership in ERP. Instead, by betting on the wrong platform, ASK handed that multi-billion dollar prize to SAP, and faded off to obscurity within CA. 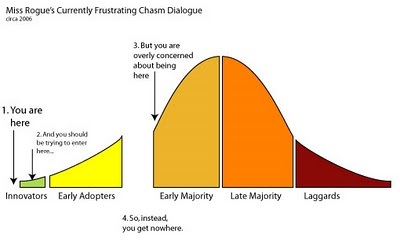 While I’m a big fan of Crossing the Chasm theory, I don’t think it applies to every situation. I think it was written to apply to disruptive infrastructure technologies. I think it can generalize to any new technology that involves significant risk to adopt. I think people over-generalize CTC theory to consumer applications and products where no such risks exist. My other quibble is that the Read/WriteWeb post suggests that early adopters are a homogeneous pool of gadget freaks who are burning out because too much whizzy technology is being thrown at them too quickly. While I do pity the gadget guy in the midst of today’s consumer tech frenzy, I think the assertion misses the bigger point that “early adopters” isn’t a demographic — i.e., it’s not primarily about people, but rather about companies and the situations they find themselves in. Put differently, CTC is largely about industrial (or B2B), not consumer, marketing. For example, publishers are one of the early adopters of Mark Logic’s XML content server technology. Is that because publishers, as a rule, are generally early technology adopters? No. Is that because the gadget guys in publishing bought MarkLogic to play with it and discovered early uses? No. It’s because of the situation that publishers find themselves in. It’s not about personalities and gadget orientations. Nor is it about industry norms on the use of technology for competitive advantage. It is, instead, all about the death of print, the transition to online, Google, free information, and the urgent need to find ways to add value in the fast-changing world around them. Trying circumstances can turn the most staid publisher into an aggressive early adopter of a technology that just might save their business. Quibbles aside, I’d say the ReadWriteWeb post is definitely worth reading. My single favorite piece of it was this graphic by Tara Hunt. With one picture she nails one of the biggest mistakes that most startups make — so read it carefully. Enjoy! This entry was posted in Chasm Crossing. Bookmark the permalink.